You have several opportunities to meet the mission co-workers that we support, as well as some visitors from South Sudan…click here to view a bulletin insert with more information. Our Executive Presbyter, Ralph Hawkins, will be serving as chaplain for a week of summer camp at Westminster Highlands next week, July 7-11. He will be preaching at the following Shenango churches in the coming weeks: Lebanon (July 20), First New Castle (July 27), and First Sharon (Aug 3). He will participate in the Ellwood City Carpenter’s Project opening worship service on July 13. He and his family will be participating in the New Wilmington Mission Conference, July 19-26, including hosting a reception in his home for mission worker Debbie Blane (July 28). Ralph welcomes opportunities to preach or bring greetings during a worship service, as well as opportunities to visit Session and Deacon meetings. Schedule a Sunday or a meeting time by contacting him at 724-528-1610 orralph@shenango.org. Does your congregation have a prayer ministry, and would they be willing to receive prayer requests from the presbytery and its international partners? Our EP, Ralph Hawkins, is developing an email list of contacts and would be grateful to include your church in occasional requests and updates. Currently, the Calvin, Coolspring, First New Castle, Lebanon, Sandy Lake, and New Wilmington prayer ministries are included. Email Ralph at ralph@shenango.org to include your contacts. Six Shenango churches and several Shenango pastors participated in the annual community worship service held during Ellwood City’s festival in the park this week. 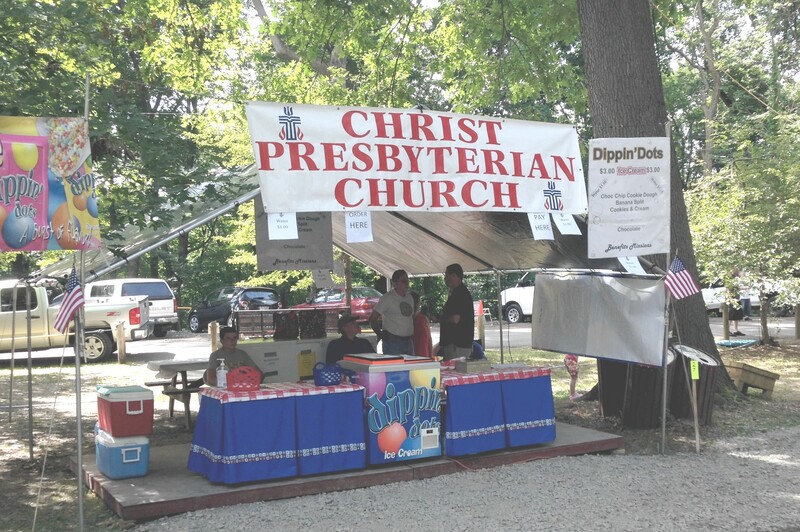 Pictured here is the mission booth run by Christ church. All proceeds from their sale of concessions go to mission support around the world. Thanks Ellwood churches, for worshipping and working together!